• Slimmest design—1 piece piston construction. • Torque line is on center. • Only 1 high pressure O’ring—easily changed with 4 bolts. • Novel swivel design is 360º or 360 x 360 with 1 piece add on. • All alloy steel construction…only true convertible tool. • Ready for optional handle. Introducing the multi-patented X Driver®. The thinnest, fastest, easiest and most versatile hydraulic torque wrench ever created. Easier to get into confined areas and around nuts in hard to access spaces. With the durability of solid steel design, less parts and clean-lined construction, this hydraulic torque wrench is so advanced it’s not only a tool, it’s an entire system. This is the most revolutionary hydraulic torque wrench system ever created. To decrease the chance of failure it has only three o-rings, versus up to nine in other hydraulic torque wrenches. The powerhead locks into the three separate drives without pins or screws, making it completely convertible. The X Driver not only has a 360 degree hose swivel, but by connecting the patented hose adapter, you have 360 by 360 rotation—on two planes. By combining the hose swivels into one attachment, the hose is more easily managed. No more messing with multiple swivel heads that get in the way of the job, or multiple hose systems that cause frustration by tangling. Only the X Driver has a patented optional holding pawl available. It’s use comes standard but “anti-lock” mode is available as well. Engage it for hands-free operation, or disengage it, if that’s your preference. The X Driver is engineered with ease of maintenance. There are no proprietary tools for taking off the end cap. The side plate tools are the same size. There is one universally available spring size inside the tool, making it an easy repair by any user. There is one single piece piston, again, decreasing your chance of failure. The profile is totally flat with no extrusions that create hangups. Designed with a smaller cylinder bore but longer levers, it creates less stress on all parts. With longer and thinnest throat radius that allows for more access to a wider range of applications and no shroud to get in the way, fitting the wrench into tight spaces becomes easier. There is no link pin. No pinch points. And the powerhead is always able to lay flat. 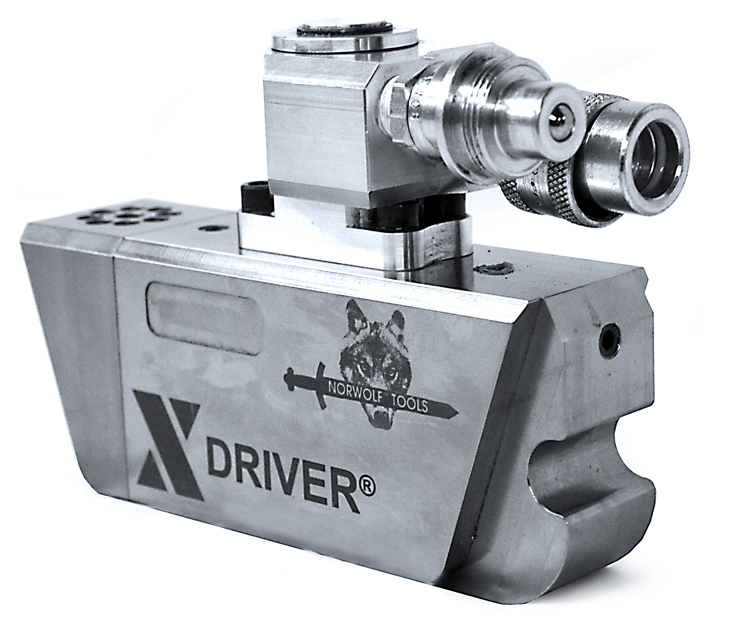 The X Driver locks into drives which fully protect the cylinder from reaction points. The X Driver pivots inside the drives, in-line, to prevent side load and tension to the cylinder, for safety and endurance. See below the X Driver® System video, from X-Driver distributor Alltite Inc.